Residents handle aftermath of hurricane with resilience, humor and spirit. 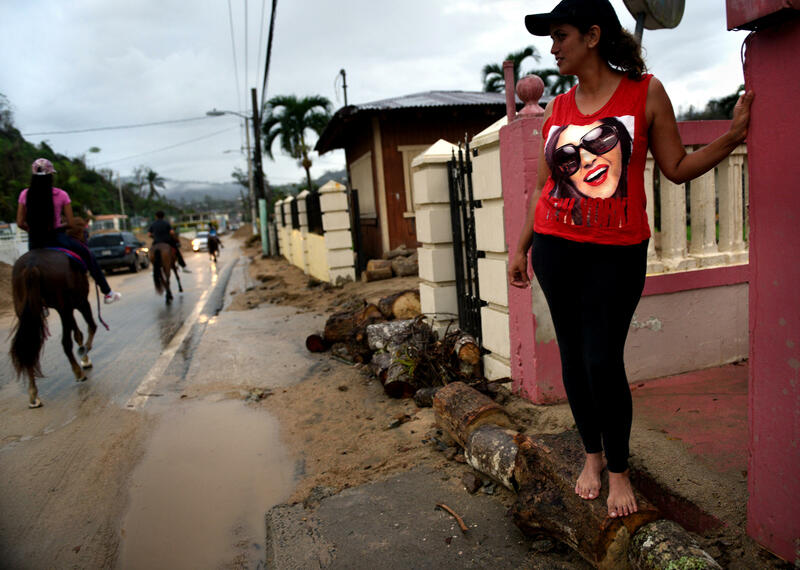 Jaylyn Rosario stands on makeshift barrier to prevent flooding of her home on Avenida Esteves, piled high with sand and debris washed in from a creek. 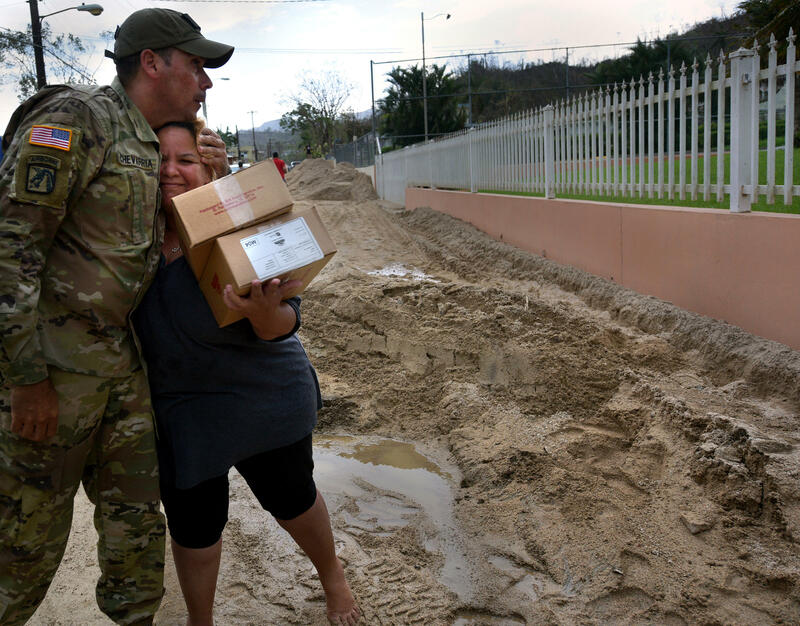 Sgt 1st Class Alejandro Echevarria hugs resident Glenda Montero as National Guard troops deliver aid needed on Avenida Esteves. 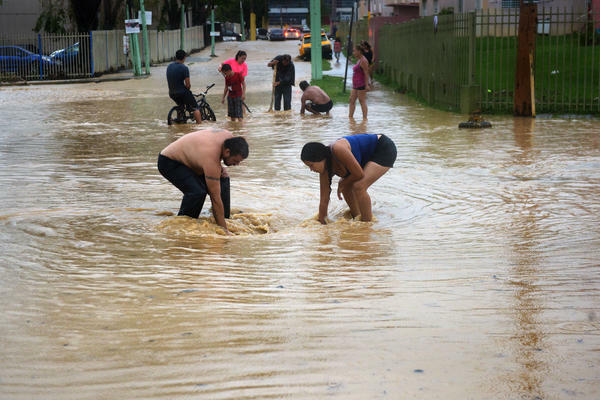 Continued flooding from the creek brings more suffering in Bilbao neighborhood of Utuado. 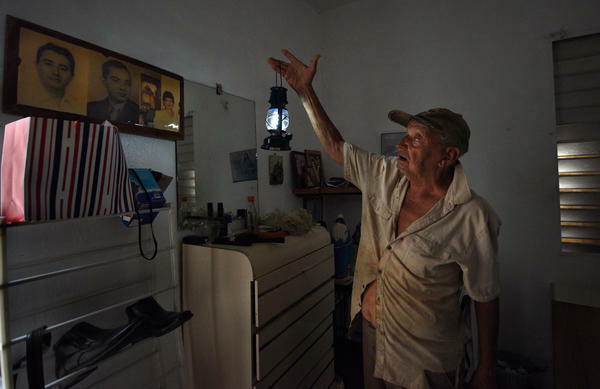 Miguel Quinones, a 93-year-old Korean war veteran, mops up and uses a battery lantern in the darkness of his home due to lack of power. Daughter Blanco Matos mops the floodwaters that seep into home of her mother 97-year-old Margarita Maestre on Avenida Esteves. An old family photo of Margarita sits on a dresser. 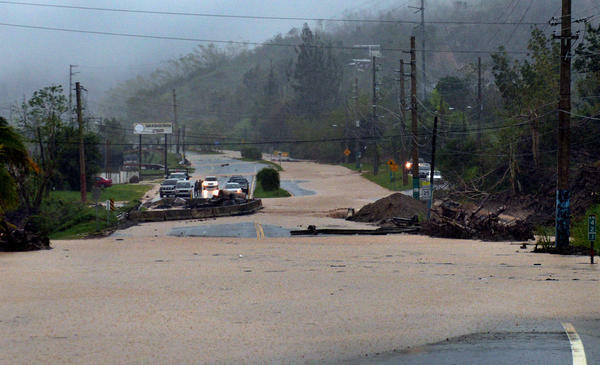 A bridge repair gives out in torrential rain and floodwaters on a street in Utuado. 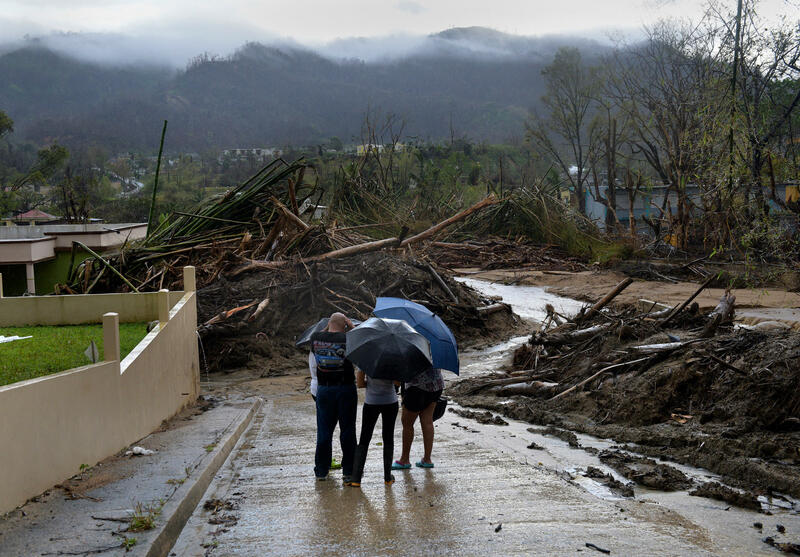 Continued flooding brings more suffering to neighborhoods of Utuado after Hurricane Maria devastated Puerto Rico. 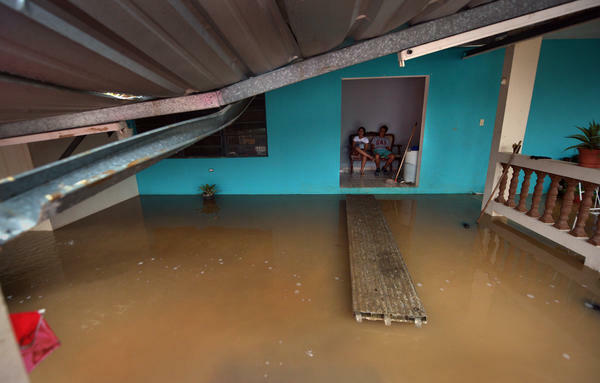 Floodwaters seep into home of 97-year-old Margarita Maestre on Avenida Esteves. 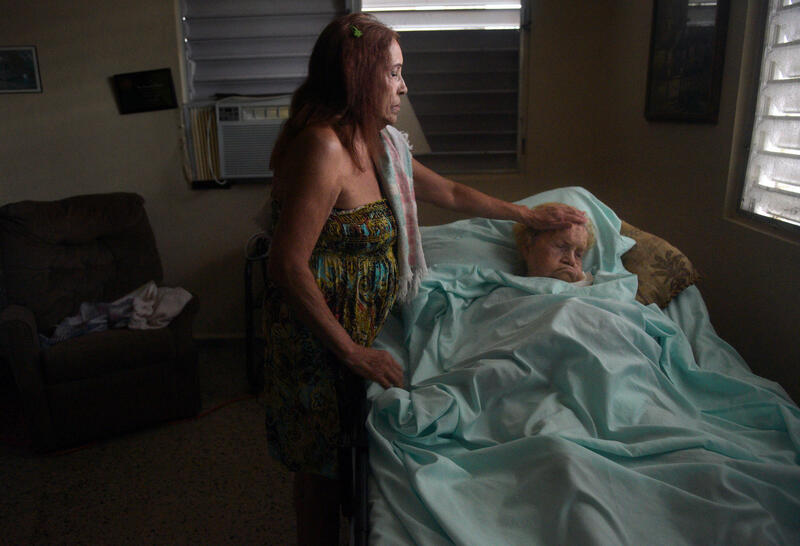 She is bedridden with respiratory issues and a feeding tube, with caregiving provided by her daughter Blanco Matos, weary from concerns about her medical needs and the inability to get her out in emergency. 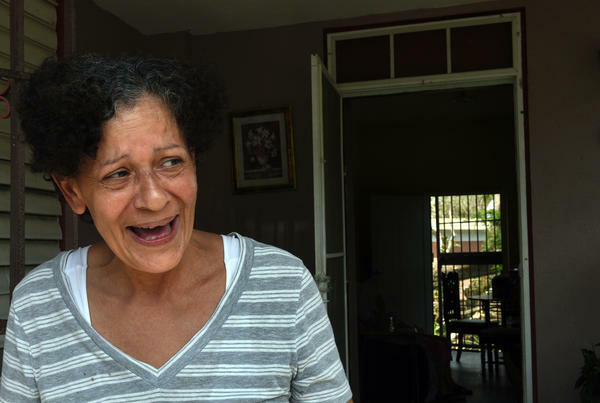 Daly Montavo, born in Puerto Rico and raised in New York City, laughs at her home on Avenida Esteves after filling jugs of water from a National Guard delivery to the neighborhood. She says, "We're here and that's all that matters." 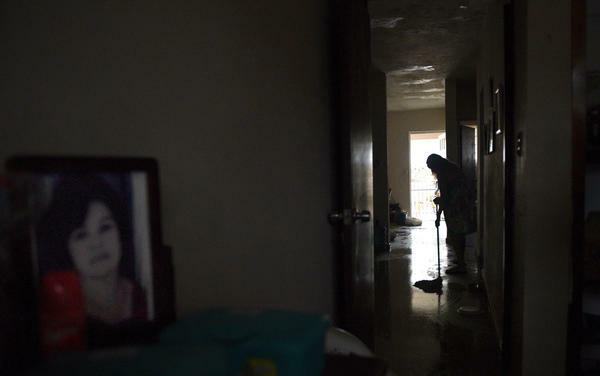 Jomar Maldonado (right) and Abigail Diaz mop up floodwaters in their home. When it rains in Puerto Rico, it rains hard and it rains fast. And this week — three weeks after Hurricane Maria — it has rained a lot. For portions of the island – especially in the mountains and in the valleys – that rain brings a continual trauma of mudslides and flooding. Even in San Juan, highway exits pool with a foot or more of water. In restaurants with cell service, the S.O.S alarms on phones ring out in a cacophony – warning of flash floods. But the capital city has fared comparatively well — it's the rural places that are doing much, much worse. 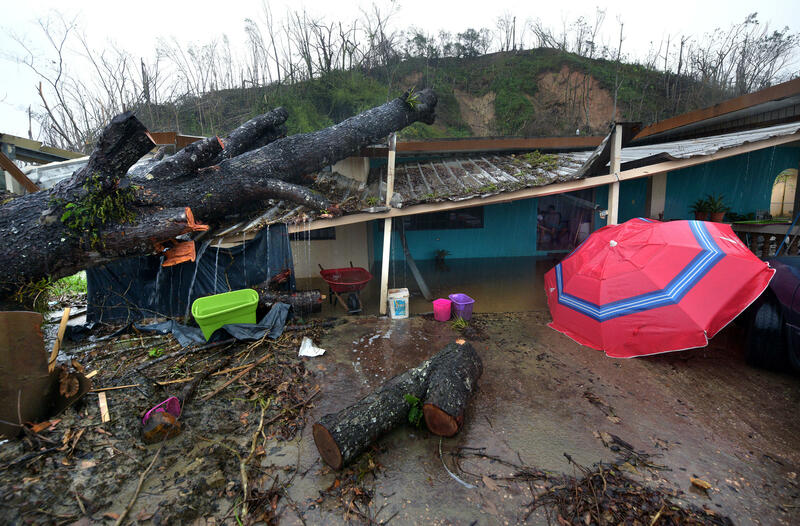 "All the progress we make is destroyed," says Blanca Matos, who lives in Bilbao, a neighborhood in Utuado. Her home, which backs up against a river, has flooded, and re-flooded, nearly every day this week. "The water is clogged up, and every time it rains it explodes and everything gets flooded." Her house is tiled, with buckets scattered about. She's used those buckets to catch rainwater since they have no running water yet. In the center of the room is a large couch which she melts into — her feet barely touching the floor as leans back, resting her head on the fabric. It's been a long three weeks, she says. Behind her, in a back room, her mother is bedridden and thought to be in the final days of her life. "He pasado mal ratos," she says in Spanish – a common expression roughly meaning "I've had it rough." Her mother, "a beauty," was a teacher for 30 years. Now, "she doesn't recognize, she doesn't speak; absolutely nothing, she can't move her hands." Neighbors helped hook up a car battery to power her mother's respiratory machine. They've stockpiled materials: gauze, Pampers, pads, Ensure. Plus, Matos has special cream on hand in case her mother develops ulcers. "I'm actually spent," she says, "But regardless of how I feel, I need to keep helping her. It has to be done." After each rain, she mops the house, cursing the river. She grew up here, but she says she never played by the river. Now, after Maria, is the first time she "has to get her feet wet." I ask her if it feels like she's in the recovery phase yet. No, she says, "we're in the process still." Across Esteves Ave., about 100 feet from Blanca Matos' house, a local pastor, and his wife Ada are caring for a group of sick and elderly – a makeshift nursing home. Their home is right next to the "quebrada" – a small creek that feeds into the river. Before the hurricane, the river was clogged up by bamboo. Since the river can't find a way to go downstream, it overflows and floods the houses across the street. They've been lucky; the water hasn't entered their house because it's just uphill enough to be out of the path. Ada Medina walks us through the house. In their living room, the remnants of a church service – before the hurricane came through they would hold services in their house. They haven't held one since Maria. Medina is a nurse and takes care of the handful of patients living here. She has a generator at the house which has been essential, she says, for her work. It provides light while she gives residents their medicine. She's been working alone this week because the woman that usually helps her set off to Ponce, a city in the southern part of the island, to look for a sister whom she hasn't had any contact with since the hurricane. In the meantime, she's hoping someone will come clean out the debris in the creek, so the neighborhood will stop flooding. José Ramos, 62, who lives down the street, isn't holding his breath for help. "Where are they?" he asks to no one in particular, "Where is the mayor? It's been three weeks and the mayor is not around." While they've waited for help, he and his son built barricades with debris to route the flood waters away from the houses on Esteves. Alongside his driveway, they've created a channel of sandbags and cinderblocks. Walking down to the river — the Vivi Arriva – behind his house, the water is about 5 feet below where we're standing. The creek up the hill runs into this river. It's not the river that floods, Ramos tells me, it's the creek up the hill that flows into the river. If a team could come and clear out the creek and dig a clear path to the river, he explains, the flooding would stop. "You don't have to be an engineer to figure this out," he says laughing. "The water didn't have no other place to go," says Daly Montavo Muñoz, 59, who moved here several years ago from Connecticut to take care of her mother. "There is no escaping it. It seems like the river decided to come down on us." Despite the damage to her house — there's currently a felled tree on top of her roof — she's a burst of energy, laughing and smiling and joking with neighbors. She says as soon as she gets power she's going to watch a movie – maybe The Lion King — just something to make her laugh and feel like a kid again. "We're strong people," she says, "we come together. We work it out as a team." As we're visiting, a neighbor's phone catches a whisper of service, and pings: "Flash Flood Watch: ... A high risk of river and small stream flooding as well as mudslides and rockfall in areas of steep terrain both in rural and urban areas." The sky is growing dark. The rain, and the flooding that follows, is coming, again. "We're bracing," says Montavo Muñoz. "We're about to live the whole thing all over again." And most likely, it won't be the last time: The forecast predicts rain through the weekend.